12 februari 2018: Op verzoek van Marleen haar achternaam weggehaald. Ook uit het artikel in de Volkskrant. In de Volkskrant van dinsdag 10 november staat mooi verhaal van Marleen op de pagina Opinie en Debat hoe zij door pertuzumab alsnog klinisch kankervrij wordt van in de lever uitgezaaide borstkanker en wellicht alsnog genezen is van een in de lever uitgezaaide borstkanker..
Het verhaal van de verdwijning van de uitgezaaide borstkanker van Marleen ........ is zo uitzonderlijk, dat ik wil weten of ze niet wordt betaald door de farmaceutische industrie. Nee zegt Marleen, ze is psycholoog van beroep. Ze begrijpt de vraag: twee jaar geleden ontdekte deze krant dat een 43-jarige Pompe patiënt, die volop in de media vertelde hoeveel ze had aan het peperdure medicijn Myozyme, werkte voor de fabrikant. Destijds stond ter discussie of Myozyme in het basispakket kon blijven - Minister Schippers besloot van wel. Bij Marleen, 43 jaar oud, werd in juli 2014 agressieve borstkanker ontdekt: uitgezaaid naar haar lever. Het verhaal van de verdwijning van de uitgezaaide borstkanker van Marleen Huis in 't Veld is zo uitzonderljik dat ik wil weten of ze wordt betaald door de farmaceutische industrie. Nee, zegt Marleen, ze is psycholoog van beroep. Ze begrjipt de vraag: twee jaar geleden ontdekte deze krant dat een 43-jarige Pompe-patiënte, die volop in de media vertelde hoeveel ze had aan het peperdure medicijn Myomize, werkte voor de fabrikant. Destijds sotnd ter discussie of myozine in het besaispakket kon blijven - Minister Schippers besloot van wel. Is borstkanker inmiddels een te genezen ziekte of op z'n minst een ziekte met een chronische karakter? Het begint erop te lijken want de laatste gegevens uit de Cleopatra studie bevestigen dat de toevoeging van pertuzumab aan de combinatiebehandeling herceptin - trastuzumab en docetaxel hoog significant verbeterde resultaten geeft t.o.v. een placebo plus herceptin - trastuzumab en docetaxel. Op een mediane follow-up van 50 maanden (range 0 tot 70 maanden), vooraf was gepland om een evaluatie te maken als er 385 doden zouden zijn bereikt, bleek een statistische significante verbeterde overall overleving (OS) was bereikt voor pertuzumab/trastuzumab/docetaxel samen (HR = 0.68, p = 0.0002). Mediane OS was 40.8 maanden in de placebo groep en 56.5 maanden in de pertuzumab groep, een verschil van 15.7 maanden dus. De progresseivrije tijd (PFS) in de pertuzumab groep was 18.7 vs 12.4 maanden in de placebo groep, HR 0.68 (p < 0.0001). Mediane tijd van behandelen in de studie was 17.4 maanden in de pertuzumab groep vs 11.4 maanden in de placebo groep. De overall overleving in de placebogroep lag op 37.6 maanden (95% CI 34.3-NE) maar is in de pertuzumabgroep nog niet bereikt (95% CI 42.4-NE) (hazard ratio 0.66, 95% CI 0.52-0.84; p=0.0008). In the CLEOPATRA study, first-line treatment with pertuzumab/trastuzumab/docetaxel significantly improved overall survival (OS) for patients with HER2-positive metastatic breast cancer compared with placebo/trastuzumab/docetaxel, providing a 15.7 month increase in the median values. The median OS of 56.5 months is unprecedented in first-line and this substantial improvement confirms the pertuzumab containing regimen as standard of care in this setting, reported Prof. Sandra Swain of the Medstar Washington Hospital Center, Washington Cancer Institute, Washington, USA during the Presidential Symposium 1 at ESMO Congress 2014 in Madrid, Spain. In the CLEOPATRA study, 808 patients from 25 countries with HER2-positive metastatic breast cancer were randomised to receive first-line placebo/trastuzumab/docetaxel or pertuzumab/trastuzumab/docetaxel. Randomisation was stratified by geographic region and neo/adjuvant chemotherapy. The patients were eligible for the study if they had HER2-positive (centrally confirmed), metastatic, locally recurrent, or unresectable breast cancer, measurable or non-measurable disease; had received ≤ 1 hormonal regimen for metastatic breast cancer prior to randomisation, disease-free interval at least 12 months since prior neo/adjuvant treatment, and LVEF ≥ 50% at baseline. The study primary endpoint was progression-free survival (PFS) independently assessed. Secondary endpoints included investigator-assessed PFS, objective response rate, safety, and OS. Final analysis was planned at 385 deaths, with two interim analyses at 165 and 267 deaths. At primary analysis in May 2011, pertuzumab was shown to increase PFS significantly, with a strong trend to OS benefit. At a second interim analysis in May 2012, the OS was improved to a degree which was both statistically significant and clinically meaningful with hazard ratio (HR) 0.66 (p = 0.0008), but the median OS in patients who received pertizumab was not reached. In July 2012, the patients still on placebo were offered crossover to pertuzumab. At ESMO 2014 the CLEOPATRA researchers reported results of a final prespecified OS analysis (February 2014). This OS analysis was planned when ≥385 deaths were reported. The log-rank test, stratified by prior treatment status and geographic region, was used to compare OS between arms, applying the threshold of p ≤ 0.0456. Subgroup analyses of OS were performed for stratification factors and other key baseline characteristics. At median follow-up of 50 months (range 0 to 70 months), the statistically significant improvement in OS in favour of pertuzumab/trastuzumab/docetaxel arm was maintained (HR = 0.68, p = 0.0002). Median OS was 40.8 months in the placebo arm and 56.5 months in the pertuzumab arm, with difference of 15.7 months. The OS benefit in predefined subgroups was consistent with previous observations. It is to be noted that following the previous report of OS benefit, 48 patients in the placebo arm crossed over to the pertuzumab arm. 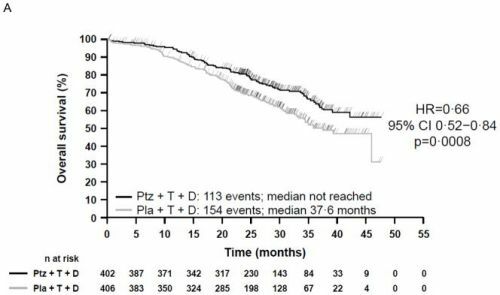 The PFS in pertuzumab arm was 18.7 vs 12.4 months in placebo arm, HR 0.68 (p < 0.0001). Median time on study treatment was 17.4 months in pertuzumab arm vs 11.4 months in placebo group. The safety profile of pertuzumab/trastuzumab/docetaxel in the overall population and in patients who crossed over to the pertuzumab arm was consistent with the known safety profile of pertuzumab with more pronounced diarrhoea, rash, mucosal inflammation, pruritus, dry skin, and muscle spasm. No new safety concerns were seen with longer follow-up. There was no evidence of cumulative or late toxicity. The long-term cardiac safety profile was maintained. Dr Lica Gianni, who discussed the study results, said that CLEOPATRA is an unquestionable therapeutic success with an unquestionable clinical implication: docetaxel/trastuzumab/pertuzumab is the new standard, not an option for first-line treatment of HER2-positive metastatic breast cancer. However, adjuvant trastuzumab was administered in only 10% of the study population. Dr Gianni said that the therapeutic role and wide applicability of dual HER2-blockade with monoclonal antibodies is established but new therapeutic approaches to improve the overall results of CLEOPATRA should address the different biology and different drug sensitivity of subsets of HER2-positive tumours. Improvements can be expected by addressing key features of HER2-positive breast cancer linked to different sensitivity in term of hormone receptor status (positive vs negative), PIK3CA status (wild type vs mutant), and immune environment. The CLEOPATRA study did not allow endocrine therapy of patients with ER-positive tumours. Dual blockade of HER2 with pertuzumab/trastuzumab and concomitant endocrine therapy is feasible as shown by APHINITY study in the adjuvant setting. Dr Gianni wondered if the addition of endocrine therapy after the end of chemotherapy can increase the already large benefit observed in women with HER2-positive/ER-positive metastatic breast cancer patients enrolled in the CLEOPATRA study. The PIK3CA status can be easily assessed on tumour biopsies or liquid biopsies. Many PI3K inhibitors are available and being tested in combination with standard HER2-directed therapy. T-DM1 is similarly active in HER2-positive tumours harbouring PIK3CA mutation. Therapies tailored according to PIK3CA mutational status of HER2-positive metastatic breast cancer should be tested. Immune mechanisms and tumour lymphocyte infiltration are involved in the probability of pCR in HER2-positive breast cancer. There is a high expression of PDL1 and CTLA4 linked to residual disease in ER-negative tumours. Dr Gianni concluded that tests should be carried out to see if blocking of CTLA4 and/or PD1/PDL1 will be useful for some patients treated per the CLEOPATRA protocol. Lancet Oncol. Author manuscript; available in PMC Jul 1, 2014. Lancet Oncol. May 2013; 14(6): 461–471. Primary results from the randomised, double-blind phase 3 study CLEOPATRA demonstrated significantly improved median progression-free survival (PFS) with pertuzumab plus trastuzumab plus docetaxel versus placebo plus trastuzumab plus docetaxel in patients with human epidermal growth factor receptor 2 (HER2)-positive first-line metastatic breast cancer (MBC). Overall survival (OS) data at the primary analysis showed a strong trend in favour of the pertuzumab arm but did not reach statistical significance. Here we report confirmatory OS results after one additional year of follow-up. Patients were randomly assigned to study treatment. OS and investigator-assessed PFS were analysed using the Kaplan-Meier approach and log-rank tests stratified by geographic region and prior treatment status. This trial is registered with ClinicalTrials.gov, NCT00567190. In the intent-to-treat population (808 patients), 267 deaths had occurred at data cut-off (placebo arm: 154 of 406 [37·9%], pertuzumab arm: 113 of 402 [28·1%]). Treatment with pertuzumab plus trastuzumab plus docetaxel resulted in a 34% reduction in the risk of death during the course of the study (HR=0·66; 95% CI 0·52–0·84; p=0·0008). Median OS was 37·6 months in the placebo arm and was not yet reached in the pertuzumab arm. A descriptive follow-up analysis of investigator-assessed PFS showed a median PFS of 12·4 and 18·7 months in the placebo versus pertuzumab arm (HR=0·69; 95% CI 0·58–0·81). No new safety concerns were identified with one additional year of follow-up. Adverse events were similar to those reported at the primary analysis with respect to incidence, severity, and specificity. This OS analysis demonstrated statistically significant and clinically meaningful survival benefit with pertuzumab plus trastuzumab plus docetaxel in patients with HER2-positive MBC. Updated analyses of investigator-assessed PFS and safety were consistent with the results from the primary analysis. Reageer op "Pertuzumab toegevoegd aan herceptin - trastuzumab en docetaxel verbetert significant ziektevrije tijd en overall overleving, aldus Cleopatra studie"
Chemo bij beginnende operabele hormoongevoelige borstkanker (ER en PR pos en HER2 neg) blijkt bij 70 procent zinloos te zijn. Bij slechts 30 procent heeft chemo enig effect. Blijkt uit grote studie van Oncogen-DX 21 genen test. Hormoontherapie vooraf aan operatie geeft dezelfde resultaten op overleving dan chemo vooraf aan operatie maar met minder bijwerkingen bij ER pos. borstkanker. Adjuvante chemotherapie gegeven om de 2 weken verbetert totale overleving op 10 jaar met mediaan 29 procent in vergelijking met chemotherapie gegeven op een standaard schema van 3 weken. Chemo bij borstkanker: Doxorubicin verpakt in liposomen - vetbolletjes geeft iets beter effect maar met beduidend minder bijwerkingen dan intraveneus chemo bij borstkankerpatienten. Paclitaxel verpakt in speciaal verpakte vetbolletjes (liposomen - Nab-paclitaxel) geeft significant langere ziektevrije tijd en minder bijwerkingen dan taxol intraveneus bij borstkanker.